The following article was originally published on Marekbros.com. MAREK Drywall Sales Manager Roland Mercier recently wrote about MAREK Houston's participation in the remodel of the Annunciation Greek Orthodox Cathedral with General Contractor Satterfield and Pontikes. MAREK's turnkey contract included framing, sheathing, roof trusses, rough carpentry, and thermal insulation, along with drywall, paint, acoustical plaster, and ceilings. The dome represents perfection, eternity, and heavens while the square support structure symbolizes Earth. Perfection is what was required from Luis as the staging location for the dome consisted of two lane closures and a dance floor with scaffolding spanning from curb to curb. 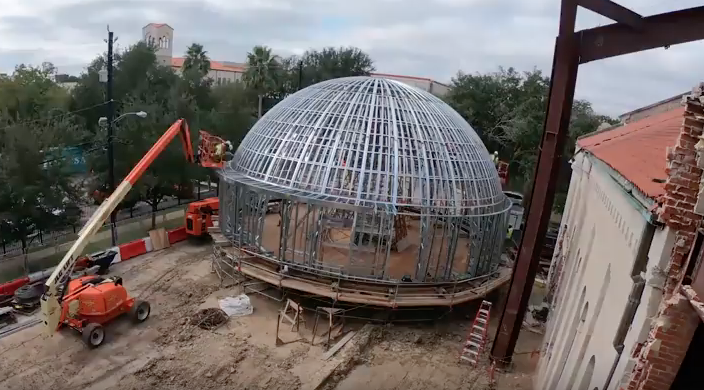 The dome structure included thirty-two trusses from Cascade Manufacturing and two trailer truck loads of prefabricated curved members from Radiustrack. The efforts of both vendors and MAREK took six months of design and engineering, three months of shop fabrication, five weeks of field assembly, and a day of lift time.